LONDON - Boots' No 7 Refine & Rewind anti-wrinkle product, which scientific research has shown can actually help to reduce the appearance of wrinkles, is being rebranded. The renamed No7 Protect & Perfect Intense Beauty Serum launched in stores today and is already selling out. The queues in stores are being driven by media reports about a study by dermatologists at the University of Manchester which found that 70% of the volunteers using the product had an improvement in their skin. The results, published in the British Journal of Dermatology, are claimed to show that the brand has genuine, long term anti-ageing benefits. Previously, there has been little evidence that cosmetic anti-ageing products can produce similar effects to ‘gold standard' prescription-only remedies. When the cream was launched in 2006, it was hailed a wonder cream and sold out after the same research team showed its effects on BBC Two's Horizon programme. 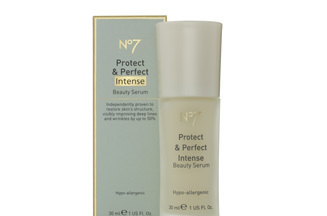 No7 Protect & Perfect Intense Beauty Serum is available at Boots, priced at £19.75 for 30ml.